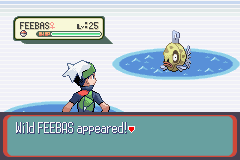 One of the most annoying Pokemon to get a hold of in Pokemon Ruby Sapphire, & Emerald is the elusive Feebas. First coming off as something that’s kind of lame/a clone of Magikarp if you have encountered it, that state of mind is toppled away after it evolves. Trying to find this pokemon however can be extremely frustrating and may leave you throwing your Gameboy Advance/DS/Gamecube out the window. This guide highlights the things associated with finding this pokemon, and hopefully you have enough patience to overcome such a task as finding Feebas. Feebas can only be found in one area which is Route 119, the place where you have to rescue the people from the weather institute from Team Magma/Aqua. 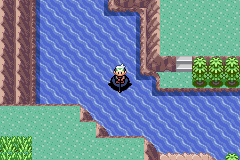 If you’ve ever looked around on this route, you’ll see that along with the high grass, many secret base locations, and pouring rain, there’s a lot of water. This is where you can find Feebas. 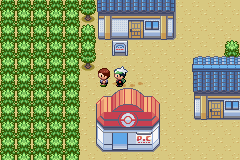 Here’s the catch though: he will only appear on six of the hundreds of tiles on that route. Yes. Six. Any rod will do, meaning you can use ANY rod, however its better to use a Super Rod as the only Pokémon you can get with that apart from Feebas is Carvanha, but patience is required if you want to catch this thing. Like in actual fishing in real life. Now, if you get annoyed and feel like shuffling the spots where the Feebas are, all you need to do is change the trendy phrase in Dewford. No, it doesn’t make sense how a trend on an island that’s nowhere near the Feebas affects them. Bear in mind that they don’t take assigned spots with the trendy phrase, so if you and your friend have the same phrase and one of you finds Feebas in one location, chances are that the other person won’t find Feebas in that location. Feebas as a Pokémon is fairly weak, however Unlike Magikarp it can learn TMs. 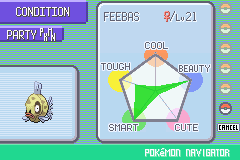 Like in the Third Generation games, Feebas is incredibly hard to find in Diamond & Pearl. However instead of 6 tiles that you can change at will, Feebas' tiles in the Mt. Coronet Range Water area is limited to 4 tiles that are changed every day. This is definitely a problem as if you are looking for a certain natured Feebas, you will have to keep looking every day. In the 5th Generation, Feebas became much easier to find. Here, it is in one of the special wild spots in water. Occassionally, when you surf around, a spot will appear in water. If you fish in this spot in Route 1 only, there is a chance that Feebas will appear thus making it very easy to find and capture Feebas. In addition to that, Milotic itself is also found via this method. Next step is to blend some Berries, either with your friends or with the people in the game. I suggest using the Ganlon Berry as it will give you the most punch even if you do poorly while blending. However any Blue or Indigo Pokéblock will raise the Beauty stat the best aswell as others that were blended with your friends if you use a Dry berry. Go to the Contest Hall and blend the Berries and thus feed the Feebas the Pokéblock or Poffin. Once you've fed it enough, you should get a chart in the Condition part of your PokéNav/Status Screen that has the Beauty peaked such as in this picture to the right, other stats can be high but they are irrelevant to this. The stat can be peaked without the Pokémon being full so you may be able to train your Feebas or Milotic in other contests too, you will know when it's been peaked when it stops saying it has been raised when you feed it Pokéblocks/Poffin. This step obviously can only be done on Ruby, Sapphire, Emerald, Diamond, Pearl & Platinum. The next step is to level it up to the next level so it can evolve. 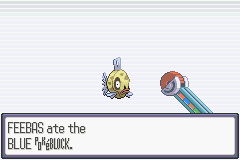 This can happen on any of the games since the stat details are saved so you can trade it to FireRed, LeafGreen, Colosseum or XD if you wish to evolve it on those games, just level it up in battle or use a Rare Candy and boom, your Feebas will start evolving. Alternatively, in HeartGold & SoulSilver, the massages that you get from Daisy Oak in Pallet Town and the haircut brothers in Goldenrod City will boost your Pokémon's Beauty stat by 22 Points per massage. After 8 of these massages, your Feebas will be at the point to evolve. Luckily, this method is not affected by nature so you'll be able to get whatever nature Milotic you want. Evolving Feebas within the 5th Generation is much easier. In addition to the evolution via its Beauty Stat, Black & White have added a new method of evolution, bringing it in line with previous Pokémon. Here, a new item, the Clean Scale is introduced. When you attach the Clean Scale to Feebas and trade it to another game, Feebas will evolve thus making the whole issue from the previous two generations inert. And that thus ends the mystery of Feebas, how to get it and how to evolve it.